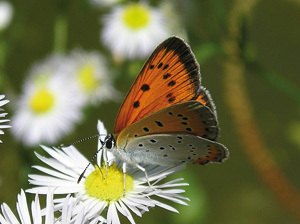 Lycaena dispar (Photo: S. Beshkov, 2006). The range of the species is confined to Europe and Turkey. Widely distributed in Bulgaria; in mountains reaches up to 800 m (Belasitsa: Belasitsa Chalet) (Slivov & Nestorova, 1988: 117). Listed in the Appendix II of the Habitats Directive 92/43 of the European Union and in Appendix II of the Bern Convention. FL88: Belasitsa [Chalet], Blagoevgrad District: ≤ 800 m (Slivov & Nestorova, 1988: 117) • FL89: Kozhuh [Hill], Blagoevgrad District, 41.4333N, 23.2500E: [280 m] (Ganev, 1984: 126) • FL89: Mt Ograzhden, Blagoevgrad District, 41.5333N, 23.2333E: ≤ 300 m (Ganev, 1986: 94) • FL89: Damyanitsa [Village], Blagoevgrad District, 41.5167N, 23.2667E: [116 m] (Lehmann, 1990: 123) • FM39: Skakavitsa [Station], Zemen Gorge, Kyustendil District, 42.4186N, 22.6553E: [650 m] (Ganev, 1983a: 81, 85, 95) • FM72: Kresna [Station], Kresna Gorge, Blagoevgrad District, 41.7333N, 23.1500E: [232 m] (Krzywicki, 1981: 40) • FM75: Blagoevgrad [Town], 42.0167N, 23.1000E: [560 m] (Krzywicki, 1981: 40) • FM78: Dupnitsa [Town], Kyustendil District, 42.2667N, 23.1167E: [535 m] (Nicholl, 1900: 32) • FM80: Sandanski [Town], Blagoevgrad District, 41.5667N, 23.2833E: [296 m] (Lehmann, 1990: 123) • FM90: Polenitsa [Village], Blagoevgrad District, 41.5667N, 23.3000E: [345 m] (Lehmann, 1990: 123) • FN91: Pancharevo [Village], Sofia District, 42.6N, 23.417E: [650 m] (Abadjiev, 1999: 281) • FN92: Bunkera [Place], Mt Vitosha, Sofia District (Ganev & Beshkov, 1987: 114) • FN94: Romcha [Station], Iskar Gorge, Sofia District (Slivov, 1968: 149) • FN97: Lakatnik [Station], Iskar Gorge, Sofia District: [300 m] (Slivov, 1968: 149) • FP51: Smolyanovtsi [Village], Montana District, 43.5000N, 22.9833E: [356 m] (Ganev & Beshkov, 1987: 114) • GM38: Kostenets [Town], Rila Mts, Sofia District, 42.26667N, 23.81667E (Bachmetjew, 1896—1897 (1896): 150) • GM47: Golyamo Belovo [Village], Pazardzhik District, 42.183N, 23.983E: [300 m] (Buresch, 1914: 123) • GN01: German [Village], Sofia District, 42.617N, 23.417E: 650 m (Abadjiev, 2001: 99) • KG86: Byaga [Village], Pazardzhik District, 42.067N, 24.367E: [200 m] (Ganev & Beshkov, 1987: 114) • KH88: Bezhanovo [Village], Lovech District, 43.233N, 24.4E: [100 m] (Ganev & Beshkov, 1987: 114) • KH89: Sadovets [Village], Pleven District, 43.3N, 24.35E: [100 m] (Abadjiev, 2001: 99) • LG15: Markovo [Village], Plovdiv District, 42.067N, 24.7E: [200 m] (Kaltchev, 1965: 267) • LG26: Sadovo [Town], Plovdiv District, 42.133N, 24.933E: [100 m] (Buresch, 1930: 229) • LG89: Stara Zagora [Town], 42.433N, 25.642E: [200 m] (Nedelkow, 1909: 128) • LH17: Lovech [Town], 43.133N, 24.717E: [100 m] (Iwanov, 1926: 216) • LH55: Sevlievo (SE) [Town], Gabrovo District (Abadjiev, 2001: 99) • LH64: Gabrovo [Town], 42.875N, 25.334E: [400 m] (Krzywicki, 1981: 40) • LH87: Veliko Tarnovo [Town], 43.086N, 25.656E: [100 m] (Krzywicki, 1981: 40) • LJ00: Pleven [Town], 43.417N, 24.617E: [50 m] (Buresch, 1930: 229) • LJ63: Svishtov [Town], Veliko Tarnovo District, 43.623N, 25.354E: [50 m] (Nedelkow, 1909: 128) • MG23: Lyubimets [Town], Haskovo District, 41.83333N, 26.08333E: [50 m] (Abadjiev, 2001: 99) • MG66: Elhovo [Town], Yambol District, 42.167N, 26.567E: [100 m] (Abadjiev, 2001: 99) • MH39: Popovo (Cherni Lom [River]), Targovishte District (Abadjiev, 2001: 99) • MH42: Sliven [Town], 42.686N, 26.329E: [300 m] (Tschorbadjiew, 1919: 184) • MH43: Kutelka [Place], Sliven District: [900 m] (Tschorbadjiew, 1919: 184) • MH92: Karnobat [Town], Burgas District, 42.65N, 26.983E: [200 m] (Abadjiev, 2001: 99) • MJ61: Razgrad [Town], 43.567N, 26.517E: [200 m] (Bachmetjew, 1902: 400) • MJ62: Gara Razgrad [Station] (Markowitsch, 1909: 12) • MJ72: Samuil (3 km N) [Village], Razgrad District: [300 m] (Abadjiev, 2001: 99) • NG39: Poda [Place], Burgas District (Buresch, 1930: 229) • NG44: Malko Tarnovo [Town], Burgas District, 41.983N, 27.533E: [300 m] (Buresch, 1930: 22) • NG49: Rosenets [Park], Burgas District (Abadjiev, 2001: 99) • NG75: Sinemorets [Village], Burgas District, 42.06667N, 27.98333E (Abadjiev, 2001: 99) • NG76: Ahtopol [Town], Burgas District, 42.1N, 27.95E: [0 m] (Buresch, 1930: 229) • NH30: Burgas [Town], 42.483N, 27.483E (Buresch, 1930: 229) • NH30: Burgas (Meden Rudnik) (Tschorbadjiew, 1915: 20) • NH57: Razdelna [Village], Varna District, 43.15N, 27.633E: [50 m] (Karnojizky, 1954: 165) • NH58: Beloslav [Town], Varna District, 43.183N, 27.7E: [50 m] (Karnojizky, 1954: 165) • NH68: Chayka [Village], Varna District, 43.233N, 28.017E: [100 m] (Buresch & Karnojizky, 1942: 132) • NH74: Obzor [Town], Burgas District, 42.817N, 27.883E (Krzywicki, 1981: 40) • NH76: Longoza [Forest], Varna District (Buresch, 1926: 159) • NH88: Euxinograd [Residence], Varna District (Buresch, 1912: 50) • NH88: Sveti Konstantin i Elena [Resort], Varna District, 43.21667N, 28.01667E (Abadjiev, 2001: 99) • NH89: Aladzha Manastir, Varna District, 43.28333N, 28.05E (Buresch & Karnojizky, 1942: 133) • NJ08: Srebarna [Village], Silistra District, 44.11666N, 27.05E (Beshkov, 1998: 81) • NJ15: Cherkovna [Village], Silistra District, 43.85N, 27.183E: [200 m] (Abadjiev, 2001: 99) • NJ44: Dryanovets [Village], Dobrich District, 43.71667N, 27.56667E: [200 m] (Abadjiev, 2001: 99) • NJ90: Balchik [Town], Dobrich District, 43.383N, 28.167E: [50 m] (Caradja, 1931: 310) • PJ10: Bolata Dere, Dobrich District (Abadjiev, 2001: 99) • PJ22: Ezeretsko Ezero [Lake], Dobrich District, 43.6N, 28.53333E (Beshkov & Abadjiev, 2000: 550) • PJ22: Shablensko Ezero [Lake], Dobrich District, 43.533N, 28.6E (Beshkov & Abadjiev, 2000: 550) • PJ23: Durankulashko Ezero [Lake], Dobrich District (Beshkov & Abadjiev, 2000: 550). 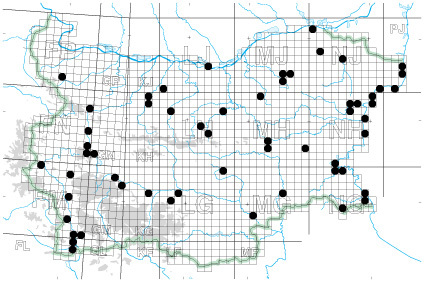 UTM map of the known distribution of Lycaena dispar in Bulgaria.